"I got skunked" is a typical way (at least in Maryland) to describe a session of windsurfing that didn't happen. Usually this is due to lack of wind, but sometimes you can be skunked for other reasons. 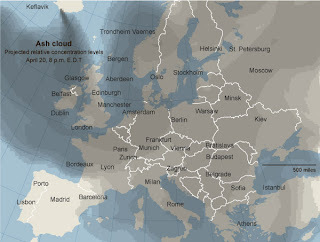 In this case, I'm missing an entire regatta because last week, a giant cloud of volcanic ash descended on Europe. Europe is a complete mess as people unable to get home are fleeing like rats to southern airports, which are the only ones currently still open. Currently, a few more airports are open, but people are making some epic journeys to get home again. As for me, my flight wasn't cancelled until the morning of my departure date. I ended up going to the Miami airport twice to find another flight. MIA reminded me of the Moscow airport - long, slow lines to the ticketing area with sad-eyed Europeans crushed up against the counters, all waiting for a sign of hope that they would get back home. I waited for a few hours to find the next flight to France (with a variety of carriers) but nothing good was available. The best flight would get me to Hyeres the night before the racing begins. With a high chance of losing my equipment in the travel confusion and a too-short jet lag recovery time, it wasn't worth it for me to push on to the regatta. I revised my plan and will now compete in Medemblik, Netherlands, at the end of May instead of beginning the season with the French regatta. 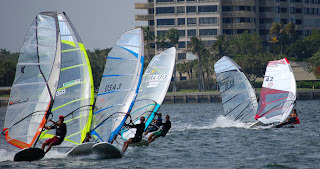 The Miami Wind and Surfers Challenge, held last weekend (April 9-11) saw some great conditions and racing by the local Formula fleet. 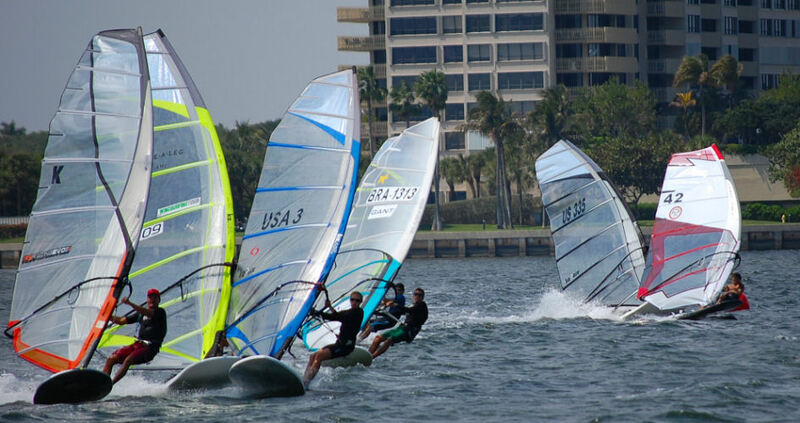 The event doubled as the Formula Experience North American Championships, and although the kids' fleet has died out in the USA in favor of the Bic Techno one-design class, a couple talented kids from Brazil and Peru showed up to race. Three local sailors participated in the Kona one-design fleet, making for some entertaining and close racing. Conditions were fantastic for all three days of racing. Wind averaged around 15 knots on Friday and Saturday, dying off a bit for Sunday as rain moved in. Our event organizer, Alex Morales, in classic fashion, ran the races "PR-style." This meant he modified the course to provide the best photo opportunities possible. The short, windward-leeward courses provided fantastic practice for starts and laylines. Alex positioned the committee boat in the middle of the course and required the fleet to sail through the start/finish line on every leg. This made the boards sail close to the boat, making us find two or even three laylines each leg instead of the usual one (and created excellent pictures of the racing for Alex's website). The short course made having a good start very critical. On the first day, I tried to start from a different place on the line each race, and on the following days I tried to start to win the first layline. This was a difficult task competing against the fastest local guys, Ron Kern and Fernando Martinez. I got off the line well for the most part, but they usually rolled me within the first minute or two. Ron and Fernando match-raced after the start, with Fernando having a slight edge on speed, but Ron pulling off some really good tactics to stay close. 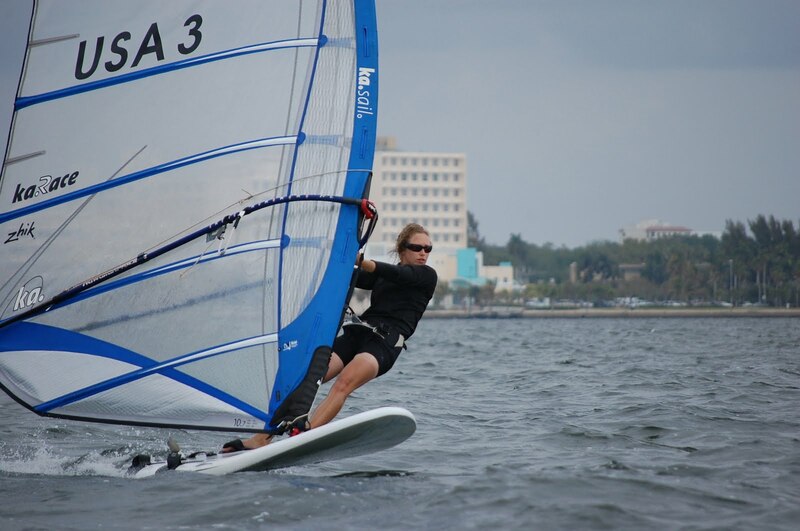 I was well matched with a Cuban National Team sailor, Raul Elosequi, and we battled it out a number of times. I had an edge with a better upwind angle, but if I made a tactical mistake or he had a better start, the fight began. Alex made the start a greater challenge when he decided that he was tired of all the boards starting on port (we were trying to avoid tacking twice to reach the layline). He moved the boat end of the line so far upwind that we couldn't get above it on port tack. Despite general eye-rolling, everyone started on starboard. With the steep starboard angle, it was more difficult to nail the best place on the line while keeping the other boards in mind, but a great exercise in timing. I finished third, a nice follow-up to the Formula Worlds. The event was well organized and really fun thanks to Alex Morales and Simona Madan. Also a big thanks to my great sponsors, Compass Marketing, and KA Sails, for making all my events exceptional. On Sunday, I leave for the French Olympic Week, my first major RS:X World Cup event of the season. As I've made some real improvements this winter, I'm really looking forward to starting the Olympic Class events.